Studies have shown that overweight women often face discrimination when applying for jobs and in other day-to-day situations, but a new study suggests that overweight men face the same discrimination too. Researchers from Rice University and the University of North Carolina, Charlotte (UNCC) conducted two studies to see what effect being overweight had on a man’s day-to-day life. The two studies, which found that discrimination was common among overweight men, have been published in the Journal of Applied Psychology. It is commonly believed that women are discriminated more for their weight. It was this belief that motivated researchers to examine the issue. In the first study, a group of non-overweight men applied for jobs and shopped at retail stores. Then, they repeated the experiment at other retail stores while wearing prosthetics that made them appear overweight. They used scripts for their interactions, to ensure their conversations and behavior was similar in both cases. The researchers found that the men wearing overweight prosthetics experienced forms of subtle discrimination. Subtle discrimination is not illegal discrimination, like turning someone down for a job for their weight, but rather treating them more negatively. Discrimination was determined by ratings the men provided on their experience, as well as evaluations from observers who were in the store and involved in the study. Both the men and the observers found that being overweight resulted in worse treatment from retail staff. The second study had participants evaluate actors in a marketing video. As in the previous study, the actors appeared in overweight prosthetics some of the time. The actors followed the same script and advertised the same products when they wore prosthetics. Once again, the study found that the men who appeared overweight faced more discrimination. The men received lower ratings when they appeared overweight, with evaluators saying they were less clean and professional. The results suggest that not only do overweight men face discrimination when applying for jobs, but they may also face discrimination from customers and clients while working. In the U.S., it is estimated that nearly three out of every four men are overweight. “Overweight and Obesity Statistics,” National Institute of Diabetes and Digestive and Kidney Diseases web site,http://www.niddk.nih.gov/health-information/health-statistics/Pages/overweight-obesity-statistics.aspx, last accessed November 17, 2015. 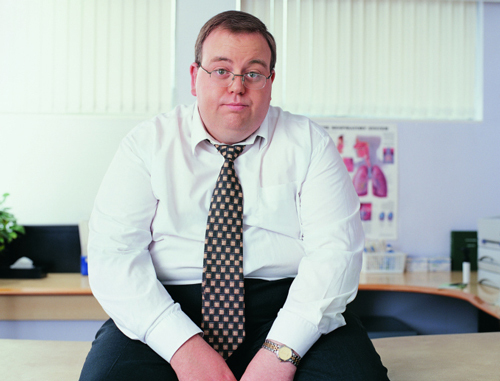 “Overweight men also face job discrimination,” Financial Xpress web site, November 17, 2015; http://www.financialexpress.com/article/industry/jobs/overweight-men-also-face-job-discrimination-2/166767/. “Overweight men just as likely as overweight women to face discrimination,” ScienceDaily web site, November 16, 2015; http://www.sciencedaily.com/releases/2015/11/151116152219.htm.